Most of the stuff that lands in my pigeonhole at work is either administrivia or wasteful paper catalogues for the library, but every now and again there’s a bit of treasure. 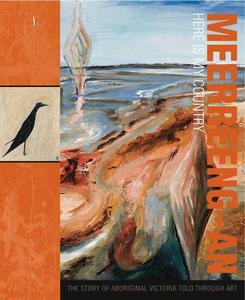 So it is with Meerreeng-an: Here is My Country, The Story of Aboriginal Victoria Told Through Art. It is stunningly gorgeous and every school in Victoria has been lucky enough to receive one. The experience of invasion and conflict is also explored, and resilience is celebrated in the sections about culture and identity, country and kin. The Time of Chaos told by Carolyn Briggs and Bunjil the Eagle created by Mandy Nicholson. This is the creation story that explains how plains along the southern coast of Victoria were inundated to form Port Phillip Bay. In the book this is also matched with a beautiful kangaroo skin cloak created by Mandy Nicholson. It is painted to form a map of Port Phillip Bay and all the rivers that flow into it. Every Melbourne schoolkid should know this story and the role of Bunjil the Eagle who resolved conflict between two warring nations and is the protector of our city. How the Murray River Was Made told by Irene Thomas and Snake and Water-lilies created by Ralph Nichollas is another creation story. The Possum Skin Cloak designed by Wally Cooper isn’t just gorgeous, it’s also symbolic of the warmth and the safety of belonging and of knowing who you are. The Eel Pot created by Doris Paton represents food cycles – hunting and gathering bush tucker. Rachel Mullett’s painting ‘Metung’ and poem will touch your heart. This is a fabulous resource for schools, (and invaluable for the Aboriginal Culture and History Cross-Curriculum Priority in the new Australian Curriculum, but it’s also essential reading for anyone interested in Aboriginal art and culture. This entry was posted on November 23, 2011 at 8:42 pm	and is filed under Aboriginal and Torres Strait Islander histories and cultures, Australian Curriculum, Australian History, Book Reviews. Tagged: Aboriginal art and culture, Aboriginal perspectives across the curriculum, Indigenous authors. You can follow any responses to this entry through the RSS 2.0 feed. Both comments and pings are currently closed.